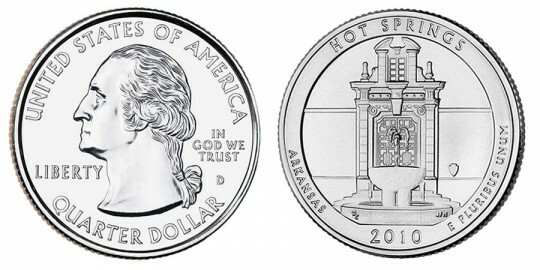 The first coin set to be released in 2010 as part of the US Mint's new America the Beautiful Quarters Program is the 2010 Hot Springs National Park Quarter. The coin honors the Arkansas site which has the unique distinction of being the first land set aside by the federal government for the use of the population in general. It helped to pave the way for the future United States National Park system, which was created years later, and which the Hot Springs system is now a part of. Five new quarters will be issued annually under the program with Yellowstone National Park, Yosemite National Park, Grand Canyon National Park and Mount Hood National Forest following the Hot Springs quarter. Specifications of the program require one design from each state, Washington D.C. and the U.S. territories that honors a national site located within its boundaries. 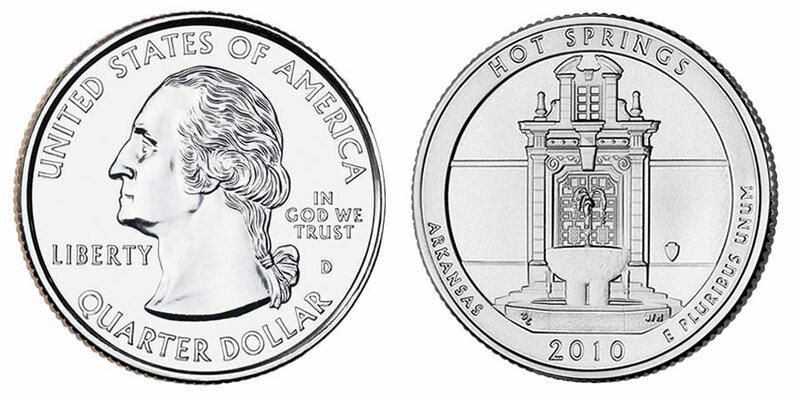 The Hot Springs Quarter officially entered circulation on April 19, 2010. Three inch diameter .999 fine silver quarter dollar bullion coins will also be issued by the Mint as part of the program. They will feature the same design as the circulating quarters. A portrait of George Washington is circled with the words "UNITED STATES OF AMERICA" and "QUARTER DOLLAR". Also shown is "LIBERTY", "IN GOD WE TRUST" and the mintmark. It was designed by John Flanagan. Don Everhart designed the reverse and it was engraved by Joseph Menna. It shows the front of the Hot Springs National Park headquarters with a thermal fountain in front of it. Also shown are the inscriptions "HOT SPRINGS," "ARKANSAS," "2010" and "E PLURIBUS UNUM."